This is a ‘recipe’ for a very tasty smoothie that I discovered myself. Smoothies don’t need a recipe, you just need complimentary flavors and enough liquid. No pic of the actual result this time, it was so good it was gone in moments. Just imagine a purple smoothie. No measurements needed, eyeball this one! Play with the amounts of ingredients. It will be fine! Make sure these fruits are safe for you! They are IC safe for some. Pour your milk into the blender. Add your peach slices, frozen blueberries, and frozen slices of bananas. If the smoothie gets too thick or the blender struggles, turn off blender, and add more milk, cover, and re-process. 1) You can be lazy like I am sometimes and throw your banana slices into a Ziplock bag and put it in the freezer. This works better for bananas than berries. Bananas will freeze and clump together but they’re still seperate-able. With berries, I recommend #2. ABOVE: Use pita pockets for easiest cutting. 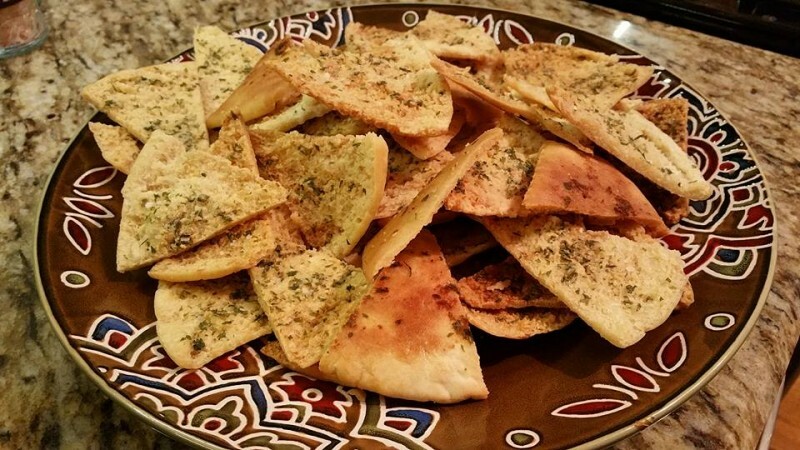 I have made this recipe twice and using the pita pockets was infinitely easier to cut and resulted in uniform thickness chips versus cutting a non-pita pocket myself. (ABOVE: Alternate wedges in order to fit maximum number of chips on the pan). (ABOVE: The brand I buy for buttermilk powder). I just subscribed to the three website deal on Americastestkitchen.com, that includes access to Cook’s Country website and Cook’s Illustrated. So, you may be seeing a lot of these recipes from now on, since they are such a trusted source I will be making many of them. I saw this recipe on the Cook’s Country website and had to try it immediately! Everyone that has tasted it has ranted and raved about it. 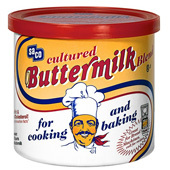 Buttermilk powder is in the baking aisle at your larger, well-equipped stores. It was maybe $5-6 and I had just bought it a month before this recipe came along for those instances where you need 1 cup of buttermilk and don’t want to buy a $4 container and have the rest go to waste. ****I had just run out of dried dill, it had lost all flavor and I threw it out. So I went with dried parsley and it was fantastic! Note: Use good quality extra-virgin olive oil here as this recipe uses a bit of it and it’s a major component! Note #2: You can use regular or whole-wheat pita bread here. **Onion can irritate some people, be careful. Adjust oven racks to upper-middle and lower-middle positions and heat oven to 350 degrees F.
Using kitchen shears, cut around perimeter of each pita and separate into 2 thin rounds. 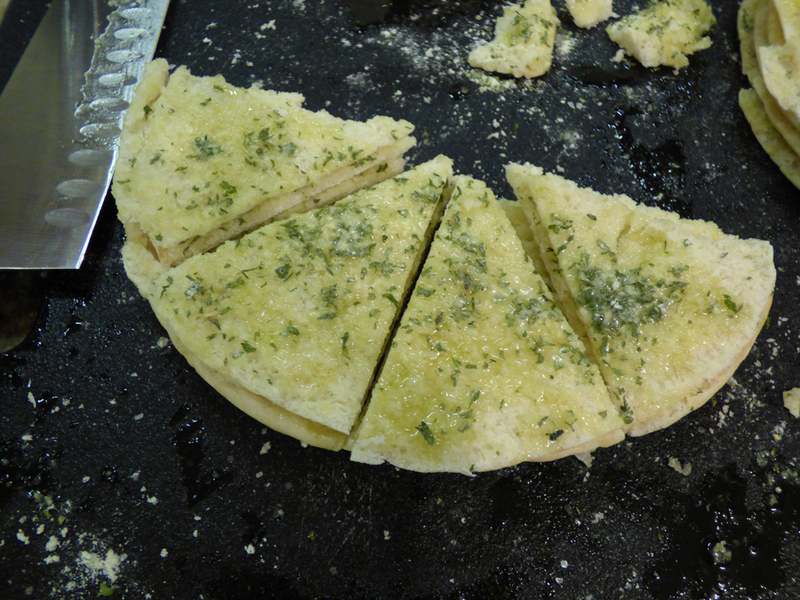 Combine buttermilk powder, dill (or parsley), salt, garlic powder, and onion powder in bowl. Working with 1 round at a time, brush cut side generously with olive oil and sprinkle with spice mixture. Stack round on top of one another, cut side up, as you go. Using chef’s knives, cut pita stack into 8 wedges. Spread wedges, cut side up and in single layer, on 2 rimmed baking sheets. 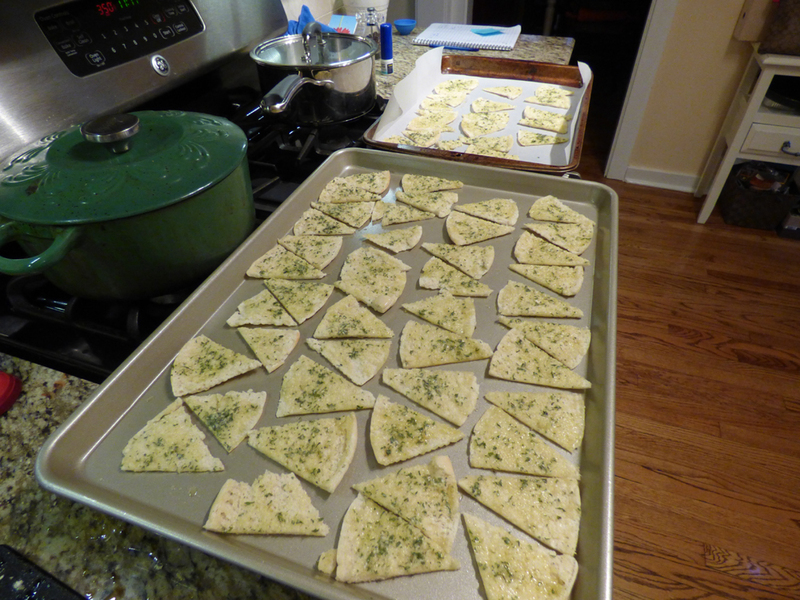 (See my photo for alternating pita chips on baking sheet to get maximum number of chips on each sheet). Bake until wedges are golden brown and crisp, about 15 minutes, rotating and switching sheets halfway through baking. 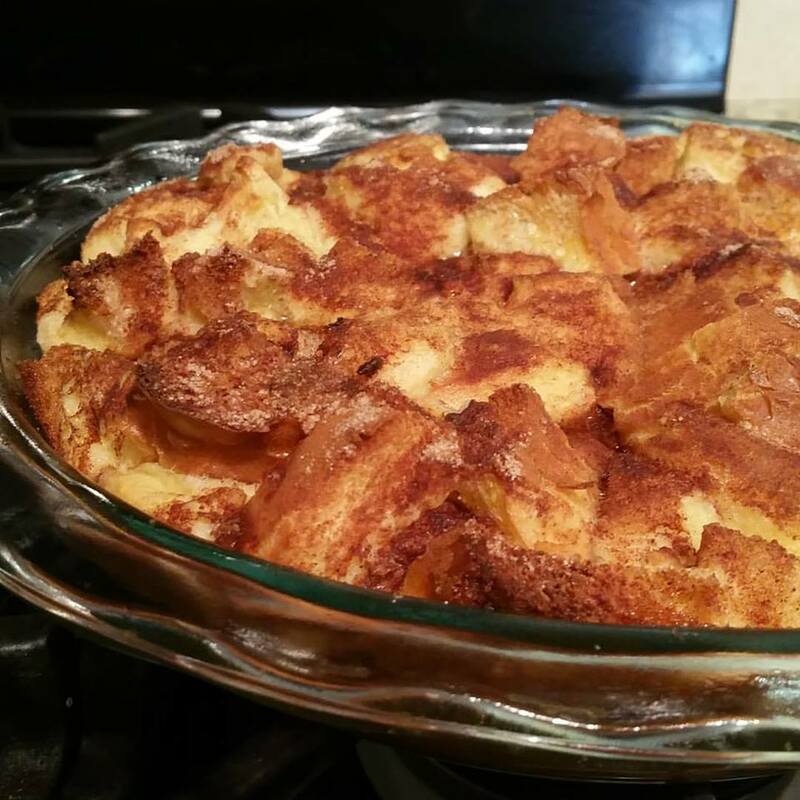 This is an excellent French toast casserole for breakfast or brunch. It’s crispy on the top but just enough softness inside – NOT too gooey inside as that’s a pet peeve of mine for any French toast product. I found this recipe in a French toast ebook. Yes, French toast ebooks exist; c’mon get with the times! LOL It is fantastic. I’d say it will give you four servings if you’re famished and six servings if you appear to eat normally, or are eating it with something else. Enjoy! NOTE: Cinnamon is a known irritant, omit it if it bothers you. Vanilla bothers me, so I omit it. Line bottom of pan with bread cubes. In a large bowl, beat together eggs, milk, 2 T. sugar, salt, and vanilla. Dot with margarine/butter. Let stand 10 minutes. Combine remaining 2 T. sugar with 1 tsp. cinnamon and sprinkle over the top. Bake in preheated oven about 45-50 minutes, until top is golden. Above: Non-peeled fresh ginger. Fresh ginger’s a unique art form by itself. 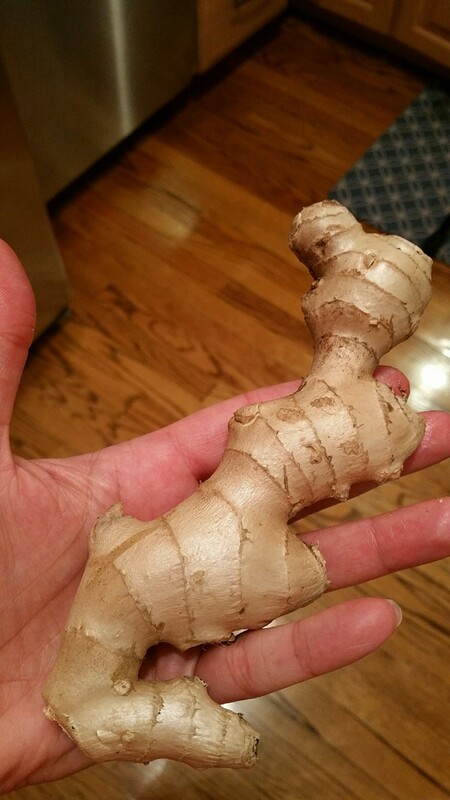 I prefer the smell of ginger freshly sliced than any fake room freshener out there (especially since I can’t even be around those artificial room fresheners). Hot New Glaze! It’s called Mahogany. It’s usually a mix of soy and honey that gives a dish’s glaze its rich color and caramelized flavor. It works on pork tenderloin as well, the recipe states. Next time the only change I’ll make is using bone-in chicken breasts and doubling the entire sauce mixture to cover to bigger breasts. We are more white-meat people for stand-alone chicken dishes. But we will definitely make this again and again! Line 2 rimmed baking sheets with heavy duty foil. In large bowl, whisk 2 T. lower-sodium soy sauce, 2 T. honey, 2 cloves pressed garlic, and 2 tsp. grated peeled fresh ginger. Add 1.5 lbs. 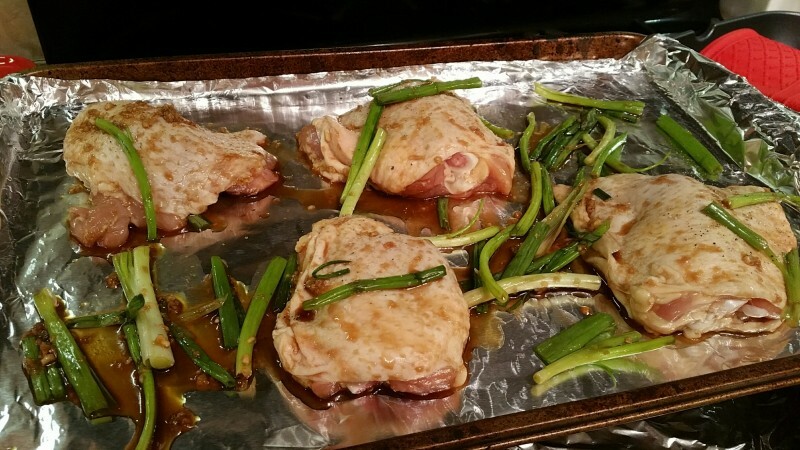 chicken thighs (fat trimmed) and 1 bunch green onions (cut into 2″ lengths). Toss to coat. Arrange chicken, skin side up, and greens onions on 1 prepared baking sheet. If making side dish: On other baking sheet, toss 1 lb. broccoli florets with 2 T. vegetable oil and 1/8th tsp salt. Arrange in single layer. 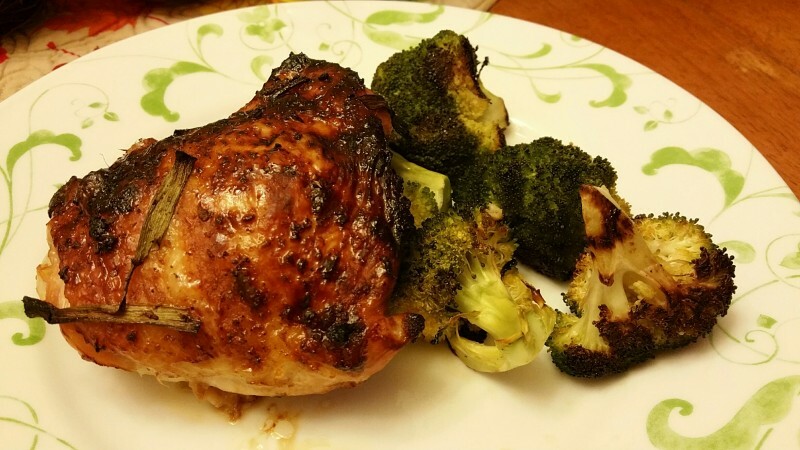 Roast chicken and broccoli in 450 degree F oven 30 mins or until chicken is cooked through (165 degrees F) and broccoli is tender. 1 LB. lean ground beef (I used 90% to avoid an oily crockpot, usually I use higher fat ground beef for other tasks like hamburgers etc). Brown ground beef, onion, and garlic (or powders), in frying pan. Add tomato sauce, tomato paste, salt, and oregano. Cook long enough to warm ingredients. Spoon a layer of meat sauce onto bottom of the slow cooker. 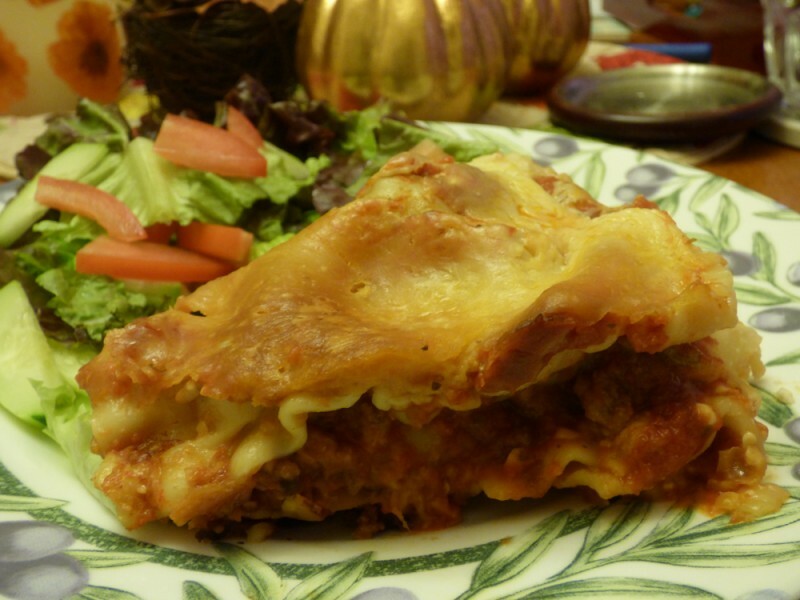 Add a double layer of uncooked lasagna noodles (break them to fit) and top with cheeses. Repeat with sauce, noodles, and cheese until all are used up.